With City being eliminated in the FA 1st Round again, it gave me a chance to get in a random game and there was a good choice as there were 5 or 6 local teams all playing at home and although my initial choice was Hull vs Southampton, Ian talked me into going to Rotherham vs Yeovil. Getting to Rotherham was surprisingly easy and quick, with it taking very little time relatively and finding the ground and subsequent parking was also fairly easy. It didn't take long to realise that everyone had a strong Yorkshire accent, missing out half the words in their sentences and that lead to several highly amusing conversations later on in the day. Anyway, once in the ground, I was soon hit with a sense of feeling like I was back in the 90s but the ground was better than I had expected. 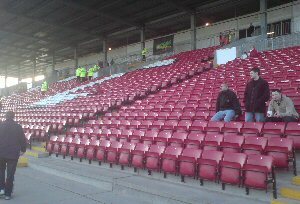 The one thing I was disappointed with though was that the pictures on Rotherham's official website lead me to believe that the new stand was complete, getting there however soon made me realise it wasn't even half finished yet and the leg room left a LOT of be desired. 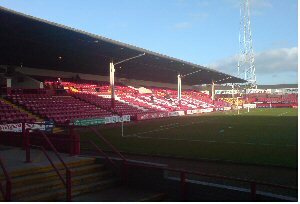 The Tivoli Stand was just to our left and it reminded me a lot of the away end at Grimsby but without the roof that mean't you couldn't see the other end of the pitch. Opposite the main stand was a stand that was divided into 3 different sections and certainly lacked consistency but it was a refreshing change to see something like that in football. The away end looked to only hold little over 1000 but still looked like a decent away end. The game started and the atmosphere was fairly impressive, especially when Rotherham established a quick 2-0 lead, it went quiet however when Yeovil pulled it back to 2-2 before Rotherham scored the winner on the stroke of half time. There were one or two original chants that I haven't seen before and it was a relief not to see the Rotherham fans do the "easy" chant are scoring. 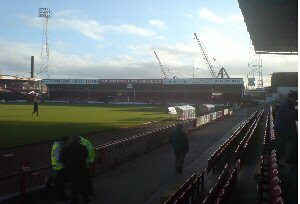 Overall, I highly enjoyed my day at Rotherham and once that stand is completed, it will be really good. 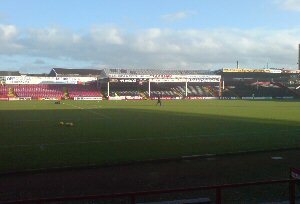 Millmoor is a great day out for football and is the sort of stadium football should be played in.